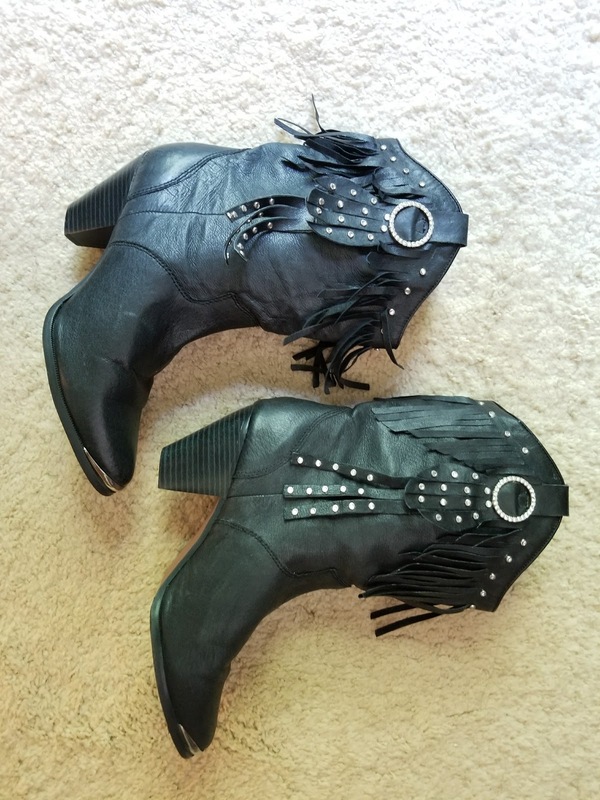 My Lord, Please Sanctuary Me: My Thrift Booty....Boots! Typically, I thrift shop without a particular idea of what I would like. Having shopped like this for years, I am pretty efficient at not having to look at every single piece of clothing. Goodwill arranges clothes by colors separating solids and patterns so I usually can walk down the aisles to see what jumps out at me. Textures and color have always drawn my attention more than patterns when it comes to tops and dresses and skirts, although I do have a soft spot for leopard prints. Sweaters are the easiest for me because they are all about texture and color, but I have so many bulky textured sweaters and last winter I did not even unpack any of them as it was a warmer winter. I like petite tops that are shorter and harder to find with a glance and longer dresses and skirts which are easier as they hang lower. In jeans, it is the opposite; I prefer finding the very rare patterns although I currently do not have any since little wild puppy Mishka nipped and ripped the few I had months ago playing as if I was a stubborn two-legged sheep to be chased and herded quite roughly every time he was awake and I was up walking. (Thankfully, he has grown out of that stage.) I have nearly every color of Gloria Vanderbilt's Amanda stretch jeans ever made, except the bright warm colors, that I wear more in the autumn and winter—my favorite of them, though, I like for summer, a lovely sage that looks refreshingly cool with a white eyelet top. When I look for jeans at thrift stores, it is more of a piece-by-piece search because the textures and colors are so similar that is it about cut and size; I am a straight leg, classic cut on the waist, regular or relaxed fit kind of girl, who hates boot cuts or any flare. I like to tuck my jeans in my boots to show them off and flares make my legs look shorter. For the Princess, it is harder. She has a more slender build and is really petite, not a borderline petite as I am. She likes earthy, more subtle colors like I do, but typically darker. Currently, her most favorite color is black and next red, although she has yet to select any clothing with red for herself, but if she is given a red t-shirt, she would wear it now and then, if it has a good message. I have noticed that she is also drawn to textures, but more open weaves to wear layered (like I did when I was a young adult). She likes her jeans with flare, which is far harder to find in the right length for her. As to foot wear, I lean towards two kinds. One is barely-there, flat, strappy leather sandals or a walking sandal that is not fancy but comfortable and practical—the latter usually has to be brand new because they develop a permanent foot impression. The other kind is a boot, actually all kinds of boots including booties, but I have a particular soft soft for boots with a western flare. 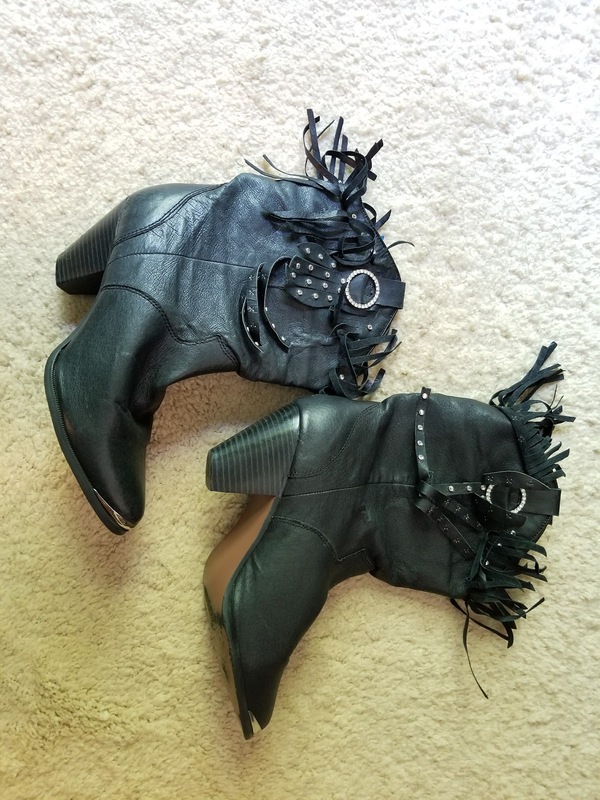 This week Independence Day was on Tuesday so her piano lesson was moved to Monday and I did not get that nice discount, but I also found some practically-new, fringed black boots that I slipped on and were so comfortable that were probably worth the extra $1.75 I had to pay. I have never had this thought in my mind before, but as I looked down at these boots on my feet: Ohhh, Mama LIKE! I caught the Princess involuntarily smiling when I actually said that out loud and I think that is going to be my new saying for extra special things like this. I may not like flashy clothes, but I cannot pass up a fringed western-style boot with a little bling! The boots looked new, but sadly unloved. The fringe was a scary mess from being left stored with the throats lopped over, but I was pretty sure that I could do something to fix that. And fix that I did! First things, first. It really would not do to fix the fringe and still have the throats bending, so I got pool noodles for $1 each at a local dollar store. 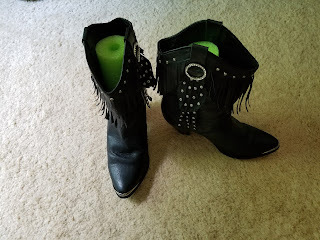 Then I cut them with a sharp knife to size I wanted for the boots and a few others that I have not shown here. The noodles were really easy to cut! Next I began working on the boot pictured on the right. I saw that many people on the internet suggest using heat, but that really did not work well. However, since I was really fortunate that these boots were made of real leather, I decided to try saddle soap. Now when I say real leather, that did not include the finer fringe at along the top of the boot which I think is a faux leather because the saddle soap did not soak into that fringe as it did on the real leather fringe on the sides of the boot, but even faux leather does well with saddle soap as it straighten itself out without anything else. 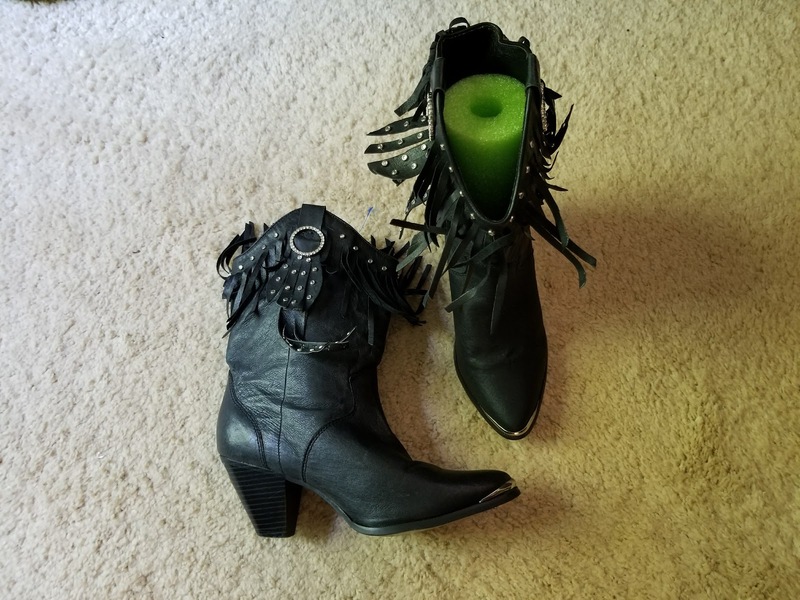 Practically, brand new leather boots for under $7 with about 20 minutes of saddle soaping and about 1/3 of a $1 noodle. Now this is why I love going to thrift stores! Thank you, my Lord, for providing not only what I need but also what I do not particularly need but just like. You always make me smile. OK, so I don't get the boot thing but I love thrift shops ~ & I like my jeans wide & baggy from the hips down. I think my love for western wear just goes with having been raised in a family of western riding horse-lovers. But the other thing is I prefer footwear are looser on the foot and yet hide and keep warm the ankles. I can take cold toes in the winter, but cold ankles really get to me.